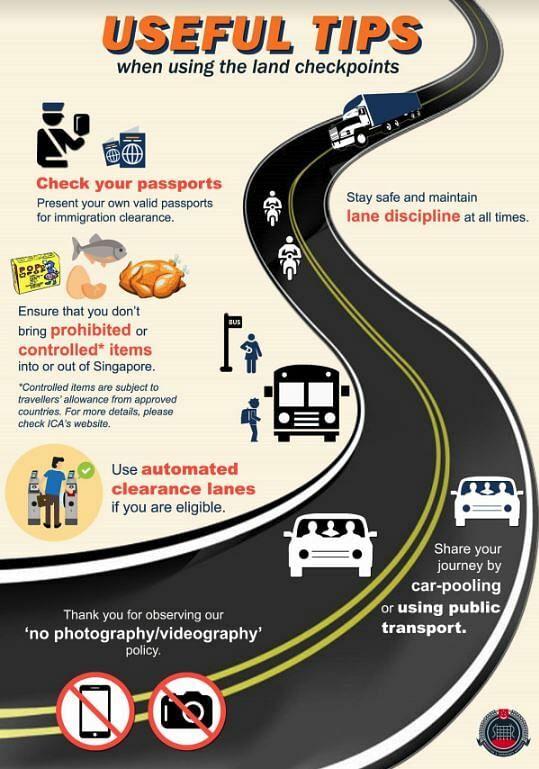 SINGAPORE - The Immigration and Checkpoints Authority (ICA) has warned travellers to expect delays at the Woodlands and Tuas checkpoints over the upcoming Hari Raya Aidilfitri weekend. The holiday falls on June 15 (Friday) this year. Traffic flow is likely to be heavy, particularly from June 14 to June 18. ICA said security at the checkpoints remains its top priority against any potential threats to Singapore. "With security checks, traffic build-up is inevitable, especially when large number of travellers use the checkpoints at the same time. Travellers are advised to adjust their travel plans where necessary," it added. It also reminded travellers to refrain from bringing into Singapore prohibited items such as "pop-pop" (snappers) and chewing gum. Those who bring in dutiable or controlled items such as meat products and potted plants need to proactively make declarations to ICA officers prior to checks. They should also check and ensure they are using their own passports with a remaining validity of six months or more. Before embarking on their journeys, motorists are advised to check the traffic situation at the checkpoints through the One Motoring website or via the Expressway Monitoring & Advisory System installed along the BKE and AYE respectively.